The Global Miller: Enter your product into the GRAPAS Innovations Awards! Enter your product into the GRAPAS Innovations Awards! 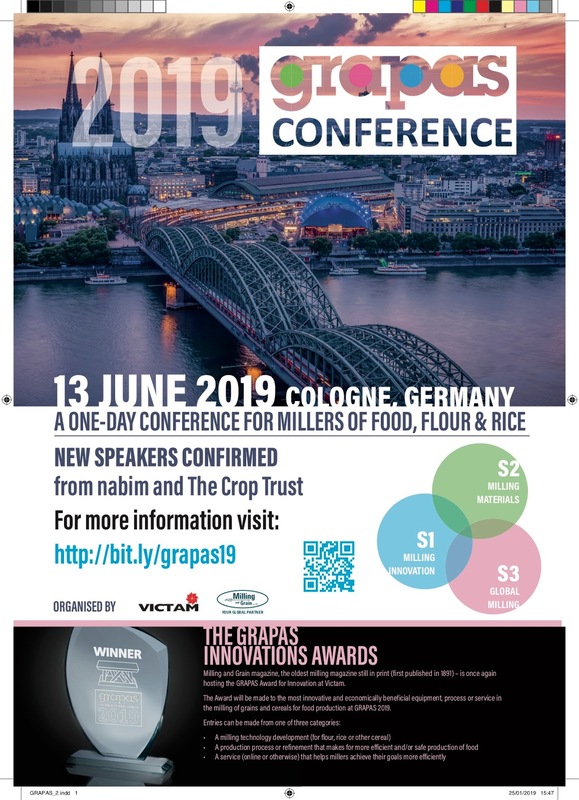 On June 13th, in Cologne, Germany 2019, the GRAPAS Innovations Awards and Conference will be taking place. The GRAPAS Innovations Awards are made to the most innovative and economically beneficial equipment, process or service introduced in recent times to the food industry, encompassing all things flour, rice and pasta. Nominations are being called for from all sectors of food milling around the world, to enter their latest products into the Innovations Awards, for a chance to get them recognised in front of thousands of Victam International attendees! The finalists selected from all applications made will have the opportunity to present their innovation at a special one-day conference on June 13th, 2019. A variety of key food machinery companies have already registered interest, including Dinnissen, Bühler, Bastak, CPM Europe, Siwertell, Brabender and many more. If you want your company to get involved with this group of heavily-influential food machinery businesses, then enter the GRAPAS Innovations Awards now! Our deadline for entries is March 31st, 2019.